Vanish Flash Highlighting Stick is rated 4.7 out of 5 by 64. 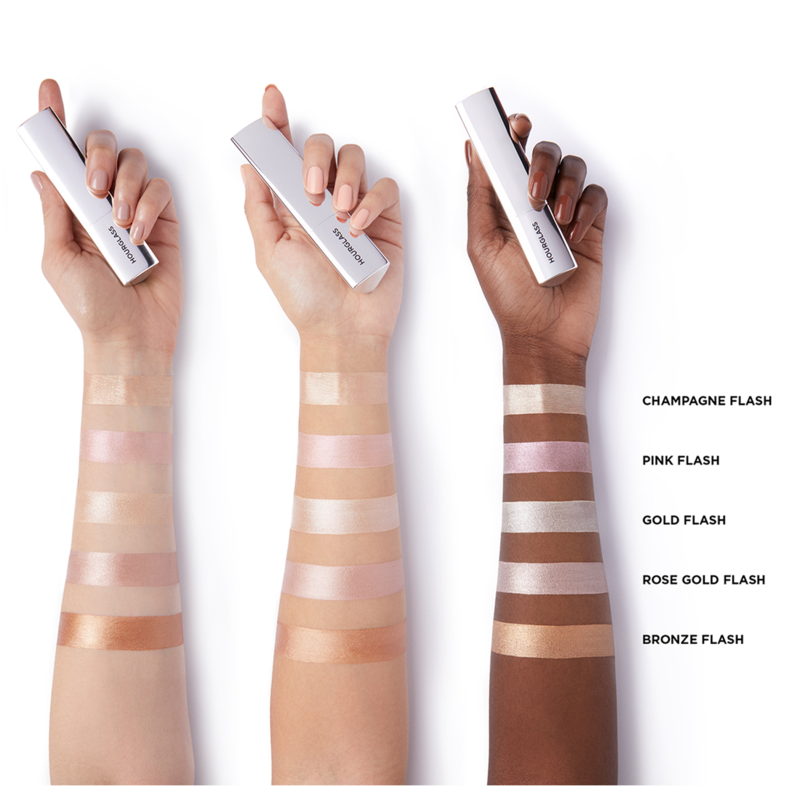 Give the face a luminous glow with Hourglass Vanish Flash Highlighting Stick, an easy-to-use luxury makeup highlighter that users can take anywhere. Lightweight and long-lasting, it adjusts to the body temperature so that it looks good no matter where users go or what they do. The unique pyramidal shape of this stick offers precise control over the product’s application. The formula is also buildable and available in a range of shades that blend easily for a more sculpted look. The hollow microspheres in this formulation give it a stunningly smooth texture for a trouble-free application and healthy, youthful appearance. These microspheres catch the light from every angle for an unparalleled glow that gets attention. The precisely sculpted Hourglass Vanish Flash Highlighting Stick uses hollow microspheres to create a shimmering glow designed for trouble-free application and blending with other makeup. Apply Vanish Flash Highlighting Stick to the high points of the cheeks, brow bone, bridge of nose and cupid’s bow. Blend out edges with fingertips. Rated 5 out of 5 by Greehy94 from Versatile, long lasting and beautiful It is rare that I ever finish using a highlighter, but this product is versatile, travel friendly, and easy to use. It is an outstanding highlighter and I have now purchased my second tube of Champagne Flash. I have found that applying directly from the tube displaces makeup underneath, but I typically apply the product with a damp beautyblender or with my finger on top of my makeup. It meshes well with the skin and last all day. It's one of my absolute favourite highlighters. Rated 5 out of 5 by DianaDS from Beautiful product I have never really been a big highlighter fan as the powders that I tried were unnatural looking (I prefer a more subdued look usually) and the creams/liquids were either too slippy, too drying, too annoying to use... but I have heard so much about this Hourglass stick and I just had to try it, especially since I'm such a big fan of all of their other products (I tried most). This highlighter is smooth, the color is beautiful and natural looking (I got the one in Champagne Flash), it lasts quite a long time on my face and gives me this healthy, lit from within look. Love it!!! Rated 5 out of 5 by MaggieFZ from Love it This is one of my absolute favourite highlighters. First of all, I love the sleek packaging and it is so easy to carry when travelling. The highlighter itself is easy to apply and it lasts long. The color are subtle which is perfect to use even for work. Rated 5 out of 5 by Iulia1 from One of my favourite highlighters I bought this a few months ago when I really didn't need any more highlighters but this has become a firm favourite. I have olive skin and bought this in champagne flash, it is the most beautiful and subtle highlighter, I always get compliments and get asked where it's from. Rated 5 out of 5 by SC3 from Really love it I have previously used the Illume Sheer Trio and loved it (until it dried out a bit and changed texture :)), so I was very excited when Hourglass came out with these dedicated highlighters. As much as I love palettes, I will always prefer a single, especially if it has been wisely chosen. I have Champagne flash for a NC/NW15 skin and it fits perfectly. The product melts into the skin (though I would caution you against applying it directly, unless you want the blinding highlight look) and somehow fuses with the base to create a very nice glow. I do not find it shimmery. The packaging is absolutely beautiful, and, to be honest, I see at least 3-5 years use out of this stick (depending on how fast Hourglass comes out with something even more appealing :) Yes, it will expire before I run out of it, that´s how little you need. I tried also the Pink shade, and, while it totally fits light skintones, I had the feeling it accentuates a tad the redness in my complexion. The bronzer shade is a bit too shimmery for my taste, but it also works well on paler skintones.